Alveolar macrophages are essential for clearing bacteria from the alveolar surface and preventing microbe-induced infections. It is well documented that smokers have an increased incidence of infections, in particular lung infections. Alveolar macrophages accumulate in smokers’ lungs, but they have a functional immune deficit. In this study, we identify an autophagy defect in smokers’ alveolar macrophages. Smokers’ alveolar macrophages accumulate both autophagosomes and p62, a marker of autophagic flux. The decrease in the process of autophagy leads to impaired protein aggregate clearance, dysfunctional mitochondria, and defective delivery of bacteria to lysosomes. This study identifies the autophagy pathway as a potential target for interventions designed to decrease infection rates in smokers and possibly in individuals with high environmental particulate exposure. Almost all smokers have an accumulation of macrophages in the terminal airways of the lung. This has been described clearly in bronchoalveolar fluid and on histological lung samples from smokers (1). Functional abnormalities of these cells, including a defect in killing of ingested bacteria, have been described (2, 3). Smokers’ alveolar macrophages are characterized by the presence of many vacuoles containing pigmented cargo. The types of vesicles present in alveolar macrophages from smokers have not been identified, nor is it known how they accumulate or the mechanism behind the defect in bacterial clearance. Autophagy is an evolutionarily conserved process that captures and recycles protein aggregates, portions of the cytosol, and cytoplasmic organelles (4). Autophagy dysfunction has been linked to a wide variety of diseases, including neurodegenerative diseases, cancer, and heart disease (5, 6). Changes in autophagy affect the removal of aged and defective mitochondria, protein aggregates, and internalized pathogens via the lysosome. Phagocytosis and delivery of pathogens to the lysosome have been shown to involve the autophagy process in recent publications (7). This study investigates autophagy changes in smokers’ alveolar macrophages and their functional significance. To our knowledge, the only studies to evaluate autophagy in smokers’ lungs come from Choi and colleagues (8, 9). They have found increased numbers of autophagosomes in tissue from patients with chronic obstructive pulmonary disease (COPD) and in lung epithelial cells exposed to cigarette smoke extract (8, 9). The role of autophagy in smoking-induced immune dysfunction and alveolar macrophage phenotype has never been examined. Alveolar macrophages are essential for maintaining the sterility of the lung, because they clear bacteria from the alveolar surface. The inability to clear bacteria increases susceptibility to pneumonia, and it is well documented that smokers have an increased incidence of pneumonia (10, 11). This study demonstrates significant accumulation of autophagosomes in smokers’ alveolar macrophages. Despite the increase in the number of autophagosomes in alveolar macrophages of smokers, a decrease in functional autophagy is present. This autophagy defect is defined by the accumulation of protein aggregates, damaged mitochondria, and decreased lysosome delivery of bacteria. Carbon-black nanoparticles (50 nm) were obtained from Nanostructured & Amorphous Materials (#1211ER; Houston, TX). Bafilomycin A from Streptomyces griseus was from Calbiochem (#196000; Gibbstown, NJ). 5,5′,6,6′-Tetrachloro-1,1′,3,3′-tetraethylbenzimidazolylcarbocyanine iodide (JC-1) was obtained from Guava Technologies (San Francisco, CA). Abs used in this study were obtained from a variety of sources. Small ubiquitin-like modifier (Sumo) 2/3 Ab was obtained from Abcam (ab3742; Cambridge, MA). Ubiquitin (#3936), and LC3b (#2775) Abs were obtained from Cell Signaling Technology (Beverly, MA). HRP-conjugated Abs anti-rabbit (sc-2004), anti-mouse (sc-2005), and anti-goat (sc-2020) were obtained from Santa Cruz Biotechnology (Santa Cruz, CA). β-Actin (#A5316) Ab was obtained from Sigma-Aldrich (St. Louis, MO). Culture media used in experiments included serum-free RPMI 1640 tissue culture media with Glutamax (61870-036; Invitrogen, Carlsbad, CA) and DMEM (11095; Invitrogen) with 10% FCS (SH30071; Hyclone FBS, Logan, UT). Kits used in this study include the CellTiter-Glo Luminescent Cell Viability Assay (G7571) from Promega (Madison, WI). A plasmid expressing microtubule-associated protein 1 L chain 3 (LC3)-GFP was obtained from Addgene (Cambridge, MA). The vector containing firefly luciferase fused to N-terminal polyglutamine (80) repeats (polyQ80-luciferase) was obtained from Conrad C. Weihl, Washington University (St. Louis, MO) (12). The mCherry-GFP-p62 vector was obtained from Johansen Terje (University of Tromso, Tromso, Norway). Alveolar macrophages were obtained from normal nonsmoking volunteers or from smokers (>10 pack year history, a pack year is defined as one pack per day for 1 year or ∼1300 cigarettes), as described previously (13). Informed consent was obtained from each volunteer after a detailed explanation of the nature and possible consequences of the procedure. Both nonsmokers and smokers were free of any underlying disease, aside from the smokers’ smoking histories. Alveolar macrophages were cultured in RPMI 1640 media with added gentamycin. In some transfection studies, RAW264.7 mouse macrophages (TIB-71; American Type Culture Collection, Manassas, VA) were used and cultured following the American Type Culture Collection’s recommendations (Eagle’s MEM with 10% FBS). Cigarette smoke extract (CSE) was prepared as described previously (14, 15). CSE solutions were prepared using a modification of the method of Blue and Janoff (16). Ten milliliters of sterile serum-free RPMI 1640 tissue culture media with Glutamax was drawn into a 50-ml plastic syringe. Forty milliliters of cigarette smoke then was drawn into the syringe and mixed with the medium by vigorously shaking them together. The smoke was expelled, and the process was repeated until one cigarette was used up. The generated CSE solution was filtered (0.22 μm) to remove large particles (17, 18). The resulting solution was designated a 100% CSE solution and was used immediately after generation. Protein isolation and Western blot analysis were performed as described previously (19, 20). Primary human alveolar macrophages were transfected with LC3-GFP vector and polyQ80-luciferase vector using Invitrogen’s Neon. Briefly, 0.5 million cells were suspended in 250 μl Resuspension Buffer “T” (Invitrogen). A total of 0.5–1 μg of plasmid per group was added to the cell suspension before transfer to a Neon tube. Using the 100-μl Neon tip and the following parameters, 1900 V, 25 W, and one pulse, the cells were electroporated. After transfer to tissue culture wells with warmed antibiotic-free medium, the cells were incubated for 4 h. After the serum/antibiotic-free medium was replaced with complete medium, cells were incubated overnight before CSE addition. RAW264.7 cells were transfected with polyQ80-luciferase vectors using Lipofectamine LTX with Plus Reagent (15338-100; Invitrogen) according to the manufacturer’s instructions. Cells were cultured in 12-well plates or in two-chamber coverslip slides. Plasmid (0.5–1 μg per condition) was suspended in 200 μl Opti-MEM with Plus reagent, mixed with the LTX reagent and allowed to incubate at room temperature for 30 min. After a 4-h incubation of the cells with plasmid, 500 μl of 2× serum medium was added to the cells before overnight incubation. CSE addition or other culture manipulations were performed the next day (4–6 h). HeLa cells were transfected with the mCherry-GFP-p62 vector as described for RAW264.7 cells. To quantify autophagosome size in alveolar macrophages from nonsmokers and smokers, transmission electron microscopy (TEM) images were analyzed for vesicle size. TEM images were obtained through the middles of cells (verified by nuclear structure). Double-walled vesicles from each individual (three nonsmokers and three smokers) were analyzed using ImageJ software (Research Services Branch, National Institute of Mental Health, Bethesda, MD). Briefly, circles were drawn around all double-walled vesicles in a cell, and identical magnifications were used for all imaging. Equal vesicle numbers were analyzed for both nonsmokers and smokers. This meant scanning more cells in the nonsmokers than smokers, because on average they contained fewer autophagosomes. Area was calculated for each vesicle, and then a standard t test analysis was performed. The effect of CSE on degradation rates of long-lived proteins was evaluated in human alveolar macrophages. Macrophages were cultured in six-well tissue culture plates in leucine-free RPMI 1640 with added [14C]leucine (0.2 μCi/ml) for 8 h. After two PBS washes, the media was changed to a chase medium with added 10 mM leucine to clear short-lived proteins from the radioactive pool. Cells were incubated for 10 h. The chase medium was replaced with fresh normal culture media (RPMI 1640 with added gentamycin), and cells were exposed to either bafilomycin A (positive control, 100 nM) or 2% CSE for 8 h. After this third incubation, supernatants were removed, and saved and cells were lysed in Western blot lysis buffer. Proteins were fractionated by adding 10% TCA (w/v) to both supernatant and lysate (1 h 4°C incubation). Precipitated proteins were isolated by spinning for 10 min at 18,000 × g spin. The radioactivities of the TCA-soluble fraction of the supernatant (a) and TCA-insoluble fraction of the cells (b) were determined via liquid scintillation counting. The percentage of long-lived proteins degraded in the culture period was determined using the formula a/a + b × 100. Data were analyzed using a nonpaired Student t test. ATP levels were monitored using the CellTiter-Glo Luminescent Cell Viability Assay according to the manufacturer’s instructions. LC3-GFP and mCherry-GFP-p62 imaging was performed. At the end of the experimental period, cells were fixed rapidly (4% paraformaldehyde) and covered with coverslips using Vectashield mounting medium with DAPI (H-1200; Vector Laboratories, Burlingame, CA). Images were acquired using a Leica truepoint-scanning spectral system (TCS SPE) confocal microscope with Leica Application Suite (LAS AF) interface (Leica Microsystems, Wetzler, Germany). Staining of endogenous LC3- and lysosomal membrane glycoprotein (Lamp) 2-positive lysosomes was performed on nonsmokers’ and smokers’ alveolar macrophages. Slides were fixed in 4% paraformaldehyde and permeabilized with 0.3% saponin. Slides were blocked for 1 h using Pierce Superblock Blocking Buffer (37535; Thermo Fisher Scientific, Rockford, IL). After the slides were washed, primary Ab (1:100 in Superblock) was added overnight, followed by secondary anti-rabbit IgG-Alexa Fluor 488 (1:1000 in Superblock). Vectashield with DAPI was applied after the final wash. Images were obtained using a Leica TCS SPE confocal microscope, and analysis was performed using Leica LAS AF, version 1.8.0. Samples were fixed overnight with 2.5% glutaraldehyde in 0.1 M cacodylate buffer. Postfixation was carried out for 1 h at room temperature with a buffered 1% osmium tetroxide solution that was reduced with 1.5% potassium ferrocyanide. Samples were en bloc stained using 2.5% uranyl acetate. Cells then were rinsed and dehydrated. Infiltration of Spurr’s epoxy resin (Ted Pella, Redding, CA) and acetone were carried out over several days to 100% resin and cured overnight in a 70°C oven. Sections 100 nm in thickness were cut using an Ultracut E ultramicrotome (Reichert-Jung, Reichert, Depew, NY). Grids then were counterstained with 5% uranyl acetate for 12 min and Reynold’s lead citrate (80 mM lead nitrate in 164 mM sodium citrate buffer) for 5 min. Samples were imaged using a JEOL 1230 Transmission Electron Microscope (Tokyo, Japan). Pathogen delivery to the lysosome was evaluated by exposing alveolar macrophages to opsonized amine-modified red fluorescent latex beads or opsonized Alexa Fluor 488-tagged E. coli. at a ratio of 25 to 1. Nonphagocytosed particles were removed by washing, and cells were incubated for a further 60–120 min. In some cases, cells were fixed and then stained for Lamp2 or LC3b. In other cases, live cells were exposed to LysoTracker Red (Invitrogen) for 30 min at 37°C. Images were obtained using a Leica TCS SPE confocal (truepoint-scanning spectral system) microscope with a Leica LAS AF interface. When alveolar macrophages from smokers are examined by both TEM and Wright-Giemsa stain, it is clear that the smokers’ macrophages contain multiple dense cytoplasmic vesicles (Fig. 1A). In this study, we identify these as autophagosomes and examine whether basal autophagy function, important for intracellular clearance of damaged proteins, organelles, and intracellular pathogens, is intact. Cigarette smoke exposure in vitro and in vivo causes an increase in the number of autophagosomes. A, Alveolar macrophages were obtained from nonsmokers and smokers. Shown are representative TEM and Wright-Giemsa stains. The higher-magnification TEM image shows the presence of double-walled vesicles in smokers’ macrophages compared with a lack of double-walled vesicles in nonsmokers’ cells. Greater than 70% of vesicles in smokers’ cells had double membranes characteristic of autophagosomes. B, Alveolar macrophages from nonsmokers were exposed to 2 or 5% CSE for 5 h. Whole-cell lysates were obtained, and Western blot analyses for LC3-II were performed. Equal loading is demonstrated by probing the same blot for β-actin. The image is representative of four separate experiments. On the right is a confocal image of human alveolar macrophages transfected with LC3-GFP. After overnight incubation, some of the cells were exposed to 2% CSE for 5 h (original magnification ×630). Confocal analysis was performed to identify GFP-positive vesicles. C, Alveolar macrophages from three nonsmokers and three smokers were analyzed for LC3-II by Western blot analyses of whole-cell proteins. Below is a graph of densitometry results. Significance was determined using a nonpaired Student t test. On the right is a representative image of fixed alveolar macrophages from a nonsmoker and from a smoker stained for LC3b (original magnification ×630). D, Alveolar macrophages from nonsmokers and smokers were fixed shortly after isolation. TEM samples were prepared, and images were obtained. Autophagosome size was determined by analyzing the area (with ImageJ software) of double-walled vesicles in cells with slices obtained through the middle of the cell (determined by the nucleus). Measurements were obtained from three nonsmokers and three smokers (12 vesicles in each cell, four cells from each person), and the area of the vesicle was obtained by drawing circles around vesicles and performing ImageJ analyses. Significance was determined using a nonpaired Student t test. At a high magnification, the TEM images demonstrate double-walled vesicles, especially in the smokers’ alveolar macrophages, consistent with autophagy vesicles (4) (Fig. 1A). Greater than 70% of the vesicles observed in smokers’ alveolar macrophages possessed double membranes. Double-walled vesicles were also present in the nonsmokers’ cells, but at low levels, consistent with normal function. LC3, the mammalian homologue of the yeast Atg8 protein, is a small protein that is conjugated to phosphatidylethanolamine during the formation of autophagosomes (21). It is synthesized initially in a preform that is cleaved at the C-terminal end (LC3-I) and modified with phosphatidylethanolamine to make the mature functional protein (LC3-II). LC3-II is a reliable protein marker for mature autophagosomes, and LC3-II levels correlate with the number of autophagic vesicles (21, 22). We first asked whether exposure to CSE altered LC3 levels in human alveolar macrophages. Proteins were isolated from CSE-exposed normal alveolar macrophages, and levels of endogenous LC3-II were compared with those of LC3-I. Despite its higher m.w., the mature phosphatidylethanolamine-conjugated form of LC3 (LC3-II) runs faster on Western blot gels due to its hydrophobicity and appears as a lower band. The LC3-II levels were increased significantly by exposure to CSE (Fig. 1B). The right side of Fig. 1B shows confocal images of alveolar macrophages transfected with a GFP-expressing LC3 transgene. The transfected cells were cultured overnight and then exposed to freshly prepared CSE for 5 h. Transfection rates were low in the primary cells, but in the cells expressing the transgene, CSE exposure resulted in the accumulation of LC3-positive punctate structures in alveolar macrophages (Fig. 1B). The data demonstrate that in vitro exposure to CSE increases the number of autophagosomes. The effect of CSE (an acute smoke exposure model) supported a pro-autophagosome accumulation effect of cigarette smoke. To analyze the effect of chronic smoke exposure as occurs in the lungs of smokers, alveolar macrophages were obtained from nonsmokers and from smokers with a >10 pack year history. Both smokers and nonsmokers were volunteers and otherwise healthy. Fig. 1C shows LC3-II Western blot analyses of whole-cell alveolar macrophage proteins from three nonsmokers and three smokers. 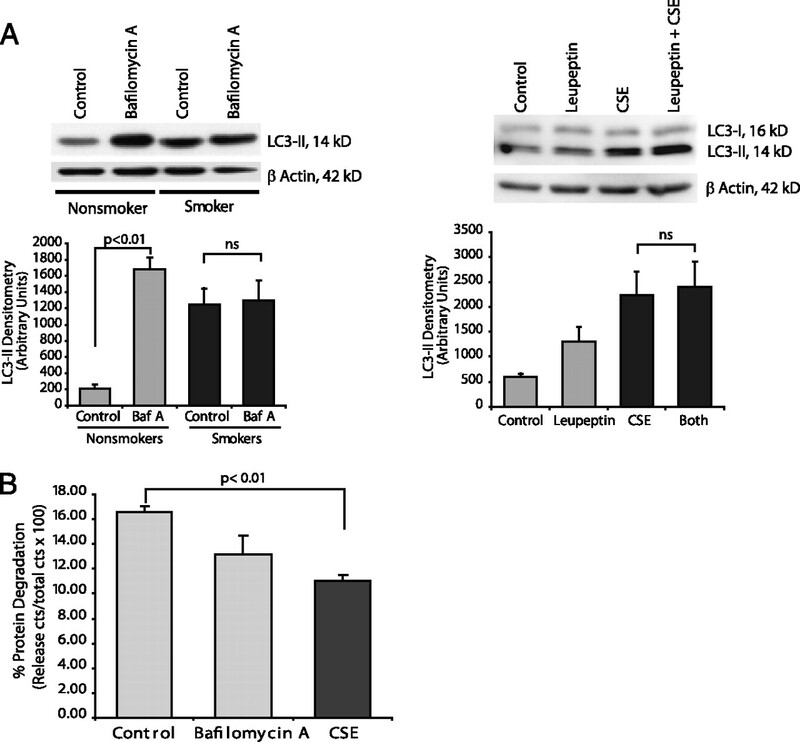 The blot shows significantly elevated LC3-II levels in the smokers’ macrophage lysates. To further examine the effect of smoking on LC3 levels, alveolar macrophages from a smoker and nonsmoker were isolated on the same day, and LC3 expression was analyzed by fixing the cells and staining for LC3 in both samples at once. There were significantly more LC3-positive vesicles in the smokers’ alveolar macrophages. The images are representative of four separate experiments. A visual examination of the autophagosomes in smokers’ alveolar macrophages suggested an increase in the size of the vesicles. To quantify autophagosome size, double-walled vesicles in TEM images were examined for vesicle area. Fig. 1D shows a significant increase in area in vesicles in smokers compared with that in nonsmokers. As a composite, the data in Fig. 1 show an accumulation and an increase in the size of the autophagosomes with both acute and chronic exposure to cigarette smoke. The next experiments examine the hypothesis that the accumulation of autophagosomes in smokers’ alveolar macrophages is the result of a block in autophagic flux rather than increased functioning of the autophagosome generation machinery. We examined autophagy flux in a number of ways. We first tested whether inhibition of autophagosome fusion with lysosomes altered LC3-II levels in alveolar macrophages. If inhibiting fusion of the autophagosomes with the lysosomes does not increase LC3-II levels in smokers, then this would suggest that there is already a block in lysosomal fusion in the cells. Fig. 2A shows that bafilomycin A (a vacuolar vacuoler ATPase inhibitor that blocks the fusion of autophagosomes with lysosomes) causes an accumulation of LC3-II in alveolar macrophages from nonsmokers. In smokers, with their already high LC3-II levels, bafilomycin A had no effect. The bafilomycin data show that in smokers’ cells fusion is already blocked and agents that might have an effect on autophagosome/lysosome fusion can have no further effect. Leupeptin will inhibit lysosomal enzymes. Also in Fig. 2A, alveolar macrophages were exposed to leupeptin with and without CSE. The LC3-II Western blot shows that CSE causes an accumulation of LC3-II that is not significantly changed by the presence of the protease inhibitor leupeptin. Cigarette smoke exposure blocks autophagic flux. A, Nonsmokers’ alveolar macrophages were exposed to bafilomycin A (100 nM) for 5 h. Whole-cell lysates were obtained, and LC3-II was quantified by Western blot analyses. The densitometry graph represents three separate experiments. Identical experiments were performed using leupeptin (50 μg/ml) to inhibit lysosome function. Western blot analyses and densitometry from three separate experiments are shown. Significance was determined using a nonpaired Student t test. B, Clearance of long-lived proteins was determined by labeling nonsmokers’ alveolar macrophages with [14C]leucine for 8 h. After a chase with cold leucine, cells were exposed to nothing (control), bafilomycin A, or 2% CSE. After an 8-h incubation, cells and supernatants were saved. TCA precipitation isolated proteins from both samples. The percentage of long-lived proteins degraded in the culture period was determined using the formula a/a + b × 100 where a equals the TCA-soluble fraction of the supernatant and b equals the TCA-insoluble fraction of the cell lysate. Data were analyzed using a nonpaired Student t test. One measure of autophagic flux is the clearance of long-lived proteins (23, 24). To evaluate the effect of CSE on protein clearance, alveolar macrophages were labeled with [14C]leucine. Short-lived radioactive proteins were cleared by incubation with 10 mM cold leucine, and then cells were exposed to CSE or the lysosomal inhibitor bafilomycin A. The percentage of long-lived proteins degraded in the culture period was determined. Fig. 2B shows that exposure to CSE decreases clearance of long-lived proteins, supporting a defect in trafficking of the autophagosomes to the lysosomes. Cigarette smoke blocks delivery of the ubiquitin chaperone protein p62 to the lysosome. A, Nonsmokers’ alveolar macrophages were exposed to CSE at varying concentrations (0.1–1.0%) for 5 h. Whole-cell lysates were obtained, and Western blot analyses were performed for p62 protein. In the right panel, nonsmokers’ alveolar macrophages were exposed to lactacystin (10 μM) with and without 2% CSE for 5 h. B, Alveolar macrophages from three nonsmokers and three smokers were analyzed for hmw p62 aggregates by Western blot analyses of whole-cell proteins. Densitometry reflects the p62-positive bands between 100 and 250 kDa. Significance was determined using a nonpaired Student t test. C, HeLa cells were transfected with mCherry-GFP-p62. After an overnight incubation, cells were exposed to 2% CSE for 5 h. Confocal analysis was performed to identify yellow (green and red colocalization) vesicles versus red vesicles. Twelve individual cells from each group were analyzed for red pixels versus green pixels (20 confocal slices per cell) (original magnification ×630). Quantification is shown in the accompanying graph. Significance was determined using a nonpaired Student t test. To examine autophagic flux in another manner, expression of p62 (also known as A170 or SQSTM1), an adaptor protein involved in the delivery of ubiquitin-bound cargo to the autophagosome (25–28), was examined. If p62 levels are increased, then this also would suggest a block in the delivery of autophagosome cargo to the lysosome. The p62 protein is a multifunctional adaptor protein with described roles in the immune system and basic cellular processes (29). The protein has a number of functional domains, including a ubiquitin binding domain, an LC3-interaction domain, a zinc-finger domain, and a Phox domain that mediates p62 oligomerization (27, 30). In a normal cell, p62 binds proteins with ubiquitin chains and delivers them to the autophagosome. In the process, p62 itself enters the organelle and is delivered to the lysosome with its cargo (29, 31). If autophagosome/lysosome fusion is inhibited, then p62 levels will increase. Fig. 3A shows that CSE exposure causes an accumulation of high m.w. (hmw) p62 aggregates. Confirming that the accumulation of hmw p62 aggregates is a function of an autophagic flux defect and not proteasome function, we exposed alveolar macrophages to the proteasome inhibitor lactacystin. CSE caused an accumulation of hmw p62, and lactacystin had no effect. To analyze the effect of chronic smoke exposure on p62 levels in the lungs of smokers, alveolar macrophages were obtained from nonsmokers and from smokers with a >10 pack year history of smoking. Fig. 3B shows that in smokers’ macrophages there is a significant accumulation of hmw p62 species that were not present in the lysates from nonsmokers’ macrophages. We used a mCherry–GFP–p62 construct to examine delivery of p62 to the lysosome. Because GFP is more unstable in cellular compartments with pH < 6.0, a decrease in the mCherry-to-GFP ratio indicates decreased autophagy flux (31). We transfected HeLa cells with mCherry-GFP-p62 to test the effect of CSE on p62 accumulation. With confocal analysis, control cells showed both yellow (green and red colocalization) and red vesicles (Fig. 3C). In contrast, with CSE exposure, there were significant yellow puncta with very little isolated red staining. With image analysis software, total fluorescent units were analyzed on a per-cell basis. The graph shows that with CSE exposure the mCherry-to-GFP ratio decreased, consistent with a loss of delivery of p62 to the lysosome. Having found both accumulation of the autophagosomes and decreased trafficking to the lysosomes in smokers’ alveolar macrophages, we next examined systems that might be impacted by a loss of the autophagy process. Three different potential outcomes were studied: 1) clearance of protein aggregates, 2) mitochondrial function, and 3) delivery of bacteria or ingested cargo to lysosomes. To examine accumulation of protein aggregates, we used a quantifiable luciferase reporter assay designed by Ju et al. (12) that measures autophagy-dependent clearance of long-lived polyglutamine protein aggregates. The murine macrophage line RAW264.7 and human alveolar macrophages were transfected with polyQ80-luciferase, allowed to rest for 24 h, and then exposed to 2% CSE for 6 h. Aggregate clearance was quantified as luciferase levels in CSE-exposed cells compared with those in controls. Fig. 4 demonstrates a significant decrease in aggregate clearance when polyQ80-luciferase-transfected cells were exposed to CSE in both cell types. To complement these in vitro acute exposure experiments, we analyzed accumulation of endogenous ubiquitin and sumo-conjugated protein aggregates. Cigarette smoke exposure results in cytosolic accumulation of protein aggregates. RAW264.7 cells and nonsmokers’ alveolar macrophages were transfected with a plasmid encoding firefly luciferase fused to polyQ80-luciferase. After transfection, cells were incubated overnight to allow for an accumulation of polyQ80-luciferase and then exposed to 2% CSE for 6 h. After CSE exposure, cells were lysed, and luciferase was assayed. Data represent mean ± SEM (n = 3). Significance was determined using a nonpaired Student t test. Aggregate clearance in alveolar macrophages also was studied by examining accumulation of hmw ubiquitin conjugates. As originally described, ubiquitin modification of proteins is linked to degradation by the proteasome. More recently, ubiquitin modification also has been linked to clearance by the autophagy/lysosomal pathway (29). Clearance of monoubiquitinated proteins, ubiquitin-conjugated misfolded and aggregated proteins, and signal-related K63 ubiquitin chains have been linked to autophagy (32–35). Fig. 5A illustrates analysis of alveolar macrophages from nonsmokers exposed to increasing doses of CSE for 5 h. The blot demonstrates a dose-dependent increase in hmw ubiquitin-bound proteins. We examined the role of the proteasome by incubating cells with the proteasome inhibitor lactacystin. Proteasome inhibition also causes a buildup of ubiquitin conjugates, consistent with the important role of the proteasome in clearing ubiquitinated proteins. However, in the CSE-exposed cells, more of the ubiquitin-staining bands are at the very top of the gel, suggesting that CSE ubiquitin accumulation is not necessarily a function of changes in proteasome function. Cigarette smoke exposure causes an accumulation of hmw ubiquitin and sumo-conjugated proteins. A, Ubiquitin analysis: The accumulation of hmw ubiquitin conjugates was assessed in alveolar macrophages from nonsmokers exposed to 0.1–1.0% CSE for 5 h. Western blot analyses for ubiquitin were done on whole-cell lysates. In the experiment shown on the right, nonsmokers’ alveolar macrophages were exposed to lactacystin (10 μM) with and without 2% CSE for 5 h. Images are representative of three separate experiments. B, Sumo analysis: The accumulation of hmw sumo conjugates was assessed in alveolar macrophages from nonsmokers exposed to 0.1–1.0% CSE for 5 h. Western analyses for sumo 2/3 were done on whole-cell lysates. In the experiment shown on the right, nonsmokers’ alveolar macrophages were exposed to lactacystin (10 μM) with and without 2% CSE for 5 h. Images are representative of three separate experiments. C, Ubiquitin analysis: Alveolar macrophages from three nonsmokers and three smokers were analyzed for hmw ubiquitin conjugates by Western blot analyses of whole-cell proteins. Densitometry reflects the ubiquitin-positive bands between 75 and 250 kDa. Significance was determined using a nonpaired Student t test. D, Sumo analysis: Alveolar macrophages from three nonsmokers and three smokers were analyzed for hmw sumo conjugates by Western blot analyses of whole-cell proteins. Densitometry reflects the sumo-positive bands between 75 and 250 kDa. Significance was determined using a nonpaired Student t test. Because it was hard to distinguish the proteasome effects from the autophagy/lysosomal effects, we also analyzed sumo-conjugated hmw complexes (36–38). Sumo is a ubiquitin-like protein that also binds lysines via an isopeptide bond and does not target substrates to the proteasome (39). There are three sumo isoforms, 1, 2, and 3. Sumo 1 binds to substrate lysines as a monomer. Sumo 2 and 3, like ubiquitin, can make long sumo chains. We used an Ab specific for Sumo 2/3 to determine if cigarette smoke exposure altered clearance of sumo-conjugated substrates. Fig. 5B shows an accumulation of sumo-positive aggregates in CSE-exposed alveolar macrophages. In contrast to the ubiquitin-conjugated proteins, lactacystin had very little effect on sumo-conjugate accumulation. As an aggregate, these data suggest that cigarette smoke exposure caused an accumulation of hmw aggregates that should normally be cleared by the autophagy/lysosomal system. To examine the in vivo effect of cigarette smoking on the accumulation of hmw ubiquitin-bound and sumo-bound proteins, we analyzed baseline lysates from nonsmokers’ alveolar macrophages and smokers’ alveolar macrophages for ubiquitin-linked proteins and sumo-linked proteins. Fig. 5C shows a significant increase in the amount of hmw ubiquitin-bound proteins in the smokers’ macrophages. The smoking histories of the three individuals consisted of 10, 20, and 45 pack years. To examine hmw sumo aggregates, lysates from nonsmokers and smokers (24, 13, and 34 pack years) were examined by Western blot analyses for sumo 2/3. Fig. 5D shows an accumulation of hmw species of sumo-modified proteins in cell lysates from smokers. As a composite, the data in Fig. 5 demonstrate that in vivo cigarette smoke exposure causes an accumulation of protein aggregates and blocks the normal cycling of ubiquitin or sumo 2/3-conjugated proteins. This is consistent with a loss of autophagy function. Autophagy is the only known mechanism for turning over large organelles such as mitochondria (40). In the case of mitochondrial turnover by the autophagosome system, the process is known as mitophagy. It is required for mitochondrial homeostasis (41). If the process of autophagy in smokers’ macrophages is nonfunctional, then mitochondrial dysfunction is a possible sequelae. We first examined mitochondrial membrane potential (mitΔΨ) in CSE-exposed alveolar macrophages. Mitochondrial membrane potential is determined by the electrochemical gradient across the inner mitochondrial membrane, and the fluorescent cationic dye JC-1 monitors mitΔΨ. Fig. 6A shows normal alveolar macrophages exposed to the mitochondrial uncoupler carbonyl cyanide m-chlorophenyl-hydrazone (CCCP) or CSE for 4 h. JC-1 accumulates in healthy mitochondria as red aggregates. The dye remains in the cytosol in a green monomeric form with loss of mitΔΨ. Both CSE and CCCP caused a loss of the red aggregated JC-1 form. We asked if smokers’ alveolar macrophages had damaged mitochondria in the cytosol. Fig. 6B shows TEM images from both smokers’ and nonsmokers’ alveolar macrophages. The smokers’ cells were characterized by the presence of damaged mitochondria, which is consistent with an inability to clear old and/or damaged mitochondria. Arrows identify mitochondrial membrane that appears compromised in the smokers’ cells. Cigarette smoke exposure results in the loss of mitochondrial electron transport chain function and accumulation of defective mitochondria. A, Human alveolar macrophages were cultured (1 × 106 cells per milliliter in two-chamber microscope slides) with and without 2–5% CSE or the uncoupler (CCCP). At the end of the incubation period, the mitochondrial stain JC-1 was added as described in the Materials and Methods. Red/orange stain denotes intact mitochondria with no disruption of membrane potential. Green staining denotes loss of mitΔΨ (original magnification ×400). B, TEM was performed on smokers’ and nonsmokers’ macrophages. Shown are mitochondria demonstrating damaged mitochondria in the smokers’ cells. Arrows in images point to intact (nonsmoker) and damaged (smoker) mitochondrial membranes (original magnification ×4000). C, Nonsmokers’ and smokers’ macrophages were allowed to adhere to two-chamber slides and stained with JC-1 (original magnification ×400). Quantification was performed as described in the Materials and Methods, and individual cell levels of red fluorescence from two separate experiments are shown in the line graphs and as a composite in the bar graph. D, Normal alveolar macrophages were cultured (96-well plate) with varying concentrations of CSE (0.5–2.0%). ATP levels were measured using a chemiluminescence assay system. Data are presented as arbitrary luminescent units and are a composite of three experiments. Significance was determined using a nonpaired Student t test. E, Nonsmokers’ and smokers’ alveolar macrophages were exposed the uncoupler CCCP for 24 h. ATP levels with and without the uncoupler were obtained, and the percentage of remaining ATP was calculated. Data are a composite of three smokers and three nonsmokers. Significance was determined using s nonpaired Student t test. F, Nonsmokers’ alveolar macrophages were exposed to the specific inhibitor of vacuolar-type H+-ATPase bafilomycin A (100 nM) or 50-nm carbon-black nanoparticles for 5 h. ATP levels were measured using a chemiluminescence assay system. Data are presented as arbitrary luminescent units and are a composite of three experiments. Significance was determined using a nonpaired Student t test. Smokers’ and nonsmokers’ alveolar macrophages were tested for mitΔΨ to examine the long-term effect of cigarette smoke exposure. To control for staining differences, bronchoalveolar lavages were performed on both smokers and nonsmokers on the same day. Cells from both subjects were loaded onto two-chamber coverslip slides and stained with JC-1. Fig. 6C shows red mitochondrial staining in the nonsmokers’ alveolar macrophages and green staining indicative of loss of mitΔΨ in the smokers’ cells. Random cells from each of three smokers and nonsmokers were analyzed for red fluorescence levels. The data show a significant loss of mitΔΨ in smokers’ alveolar macrophages. We next examined functional consequences of a loss in mitochondrial function. We have shown previously that the majority of nonsmokers’ alveolar macrophage ATP comes from the mitochondria (20). We asked if acute exposure to CSE would lead to a loss of ATP. The graph in Fig. 6D shows decreasing ATP levels with increasing doses of CSE. It is possible (and not inconsistent with the literature) that long-term smoke exposure would lead to reliance on anaerobic glycolysis for smokers’ alveolar macrophage energy generation. We addressed the question of whether long-term smoking led to a shift in ATP production from oxidative phosphorylation to glycolysis. We exposed smokers’ and nonsmokers’ alveolar macrophages to CCCP for 4 h. CCCP is a mitochondrial uncoupler that rapidly dissipates the proton gradient and stops mitochondrial ATP production. The nonsmokers’ alveolar macrophages were much more sensitive to the ATP-depleting effects of CCCP than the smokers’ macrophages (Fig. 6E). This is consistent with an increase in anaerobic glycolysis (mitochondria-independent) ATP production in smokers’ alveolar macrophages. We do not propose that loss of mitochondrial ATP production is entirely due to loss of autophagic flux. However, lack of clearance of damaged organelles would set up a feedback loop, preventing mitochondrial recovery (41). To investigate whether blocking autophagic flux alone would damage mitochondria in alveolar macrophages, we treated normal alveolar macrophages with bafilomycin A to block autophagosome/lysosome fusion. We also added carbon-black nanoparticles (a process that would mimic the accumulation of particulates from cigarette smoke) that would stress the fusion process by accumulating in autophagosomes. ATP was used as a measure of mitochondrial injury. Both bafilomycin A and 50-nm carbon-black nanoparticles caused a drop in ATP levels in nonsmokers’ alveolar macrophages (Fig. 6F), showing that inhibiting autophagosome/lysosome fusion caused mitochondrial dysfunction. There was no effect of either bafilomycin A or carbon-black nanoparticles in the smokers’ macrophages, suggesting a decreased reliance on oxidative phosphorylation in smokers’ macrophages. The data in Fig. 6 show that both in vitro and in vivo smoke exposure leads to the accumulation of defective mitochondria and results in the subsequent loss of mitochondria-derived ATP. In addition, we show that in nonsmokers’ macrophages inhibiting fusion of the autophagosome with the lysosome decreases mitochondrial ATP production. Although first described as a process that improves cellular survival in conditions of nutrient depletion, recent work suggests an important role for autophagy in the immune system (42, 43). Xenophagy refers to the autophagic process that targets intracellular pathogens to the lysosome via an autophagosome (5, 44–46). We first examined the delivery of opsonized fluorescent latex beads to either the autophagosome or the lysosome in nonsmokers’ and smokers’ macrophages. Nonsmokers’ and smokers’ alveolar macrophages were cultured on coverslip chamber slides and exposed to a 25:1 solution of opsonized 0.5-μm amine-modified latex beads for 1 h. The amine-modified beads are used routinely in phagocytosis assays and easily opsonized. Noninternalized beads were washed off, and the cells were incubated for a further hour before fixing and staining for either autophagosomes (LC3) or lysosomes (lamp2a). Fig. 7A demonstrates the colocalization of the red beads with the green autophagosomes in macrophages from both smokers and nonsmokers. However, only the nonsmokers’ cells showed colocalization of beads and lysosomes (Lamp2a staining). Cigarette smoke exposure impairs delivery of cargo to lysosomes. A, Alveolar macrophages from nonsmokers and smokers were placed in culture. After a 3-h stabilizing period, cells were exposed to 0.5-μm latex beads for 60 min. Nonphagocytosed beads were washed off, and cells were incubated for a 2-h chase period. Cells then were fixed and stained for either LC3b (autophagosomes) or Lamp2 (lysosomes) (original magnification ×630). B, Alveolar macrophages from nonsmokers and smokers were placed in culture. After a 3-h stabilizing period, cells were exposed to 50-nm carbon-black nanoparticles for 60 min. Nonphagocytosed nanoparticles were washed off, and cells were incubated for a 2-h chase period. Cells then were fixed, and TEM analyses were performed. Shown is a representative cell demonstrating carbon-black nanoparticles in double-walled vesicles (original magnification ×4000). C, Alveolar macrophages from smokers and nonsmokers were cultured on a coverslip chamber slide. Cells were exposed to Alexa Fluor 488 E. coli for 30 min, nonphagocytosed bacteria was washed off, and a 1-h chase incubation followed before staining the cells with LysoTracker Red or fixing and staining for Lamp2 with an Alexa Fluor 568 secondary Ab. The images are representative of three separate experiments (original magnification ×630). The photomicrographs show red lysosomes, green E. coli, and a yellow merged image of E. coli in a lysosome. D, The diagram outlines the conclusions from this study. 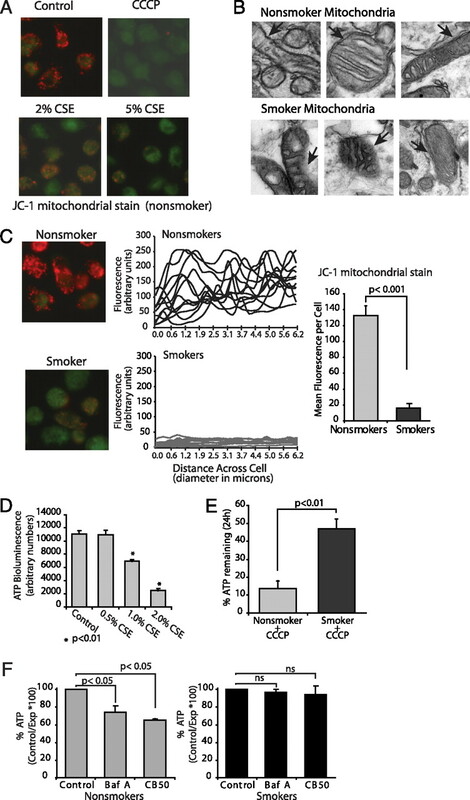 Prolonged cigarette smoke exposure leads to accumulation of nonfunctional autophagosomes by blocking lysosomal trafficking. The block in autophagic flux leads to decreased clearance of protein aggregates, mitochondrial dysfunction, and reduced delivery of phagocytosed bacteria to the lysosome. To test the delivery of other types of phagocytosed cargo to the autophagosome, alveolar macrophages were exposed to opsonized 50-nm carbon-black nanoparticles for 1 h. The cells then were fixed, and TEM studies were performed. Fig. 7B shows that in both nonsmokers’ and smokers’ macrophages carbon-black nanoparticles end up in double-walled vesicles characteristic of autophagosomes. We examined delivery of Escherichia coli particles to lysosomes in nonsmoker versus smoker macrophages. As in earlier comparison stains, smoker and nonsmoker cells were seeded onto the same two-chamber coverslip slide. Alveolar macrophages were exposed to Alexa Fluor 488-tagged E. coli particles for 1 h. This was followed by a chase period for the particles to move to lysosomes. For lysosomal staining, a LysoTracker Red dye was added to live cells, or fixed cells were stained for Lamp2. Fluorescent images were obtained. It is important to note that the smokers’ alveolar macrophages underwent less phagocytosis, consistent with existing literature. However, the smokers’ cells did phagocytose some particles, which allowed us to ask if internalized particles were delivered to the lysosome. The images in Fig. 7C show that the E. coli particles are delivered to the lysosome in the nonsmokers’ alveolar macrophages. This was not true in the smokers’ cells where green (E. coli) and red lysosomes do not colocalize. 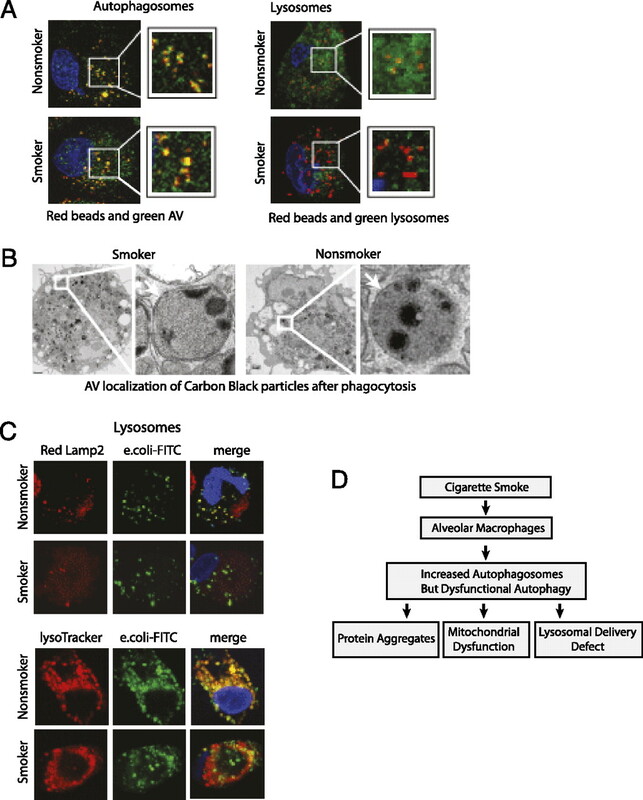 These data suggest that the normal delivery of pathogen cargo to the lysosomes by autophagosomes is disrupted in smokers’ alveolar macrophages. This study’s major finding reveals that chronic inhalation of cigarette smoke causes a profound defect in autophagy/lysosomal function in human alveolar macrophages (Fig. 7D). This was demonstrated by lack of clearance of aggregated proteins and hmw ubiquitinated proteins, accumulation of abnormal mitochondria with altered function, and loss of cargo delivery to lysosomes. The same alterations could be triggered in alveolar macrophages from nonsmokers acutely exposed to cigarette smoke in vitro. This defect in autophagy/lysosomal function was not due to fewer autophagosomes because smokers’ macrophages had significantly more of these vesicles than nonsmokers’ macrophages. The data are consistent with a loss of autophagic flux, leading to an accumulation of autophagosomes and defects in autophagy clearance functions. A relationship between smoking and autophagy has been described elegantly by Choi and colleagues (8). They found increased numbers of autophagosomes in epithelial tissue from patients with COPD compared with those in normal tissue (8). This work showed increased expression and activation of autophagy regulator proteins, including LC3B, beclin 1, Atg5, and Atg7. A similar increase in the number autophagosomes was found in the lungs of mice subjected to chronic cigarette smoke inhalation and in lung epithelial lines exposed to CSE (8). The increase in generation of autophagosomes was reversed by overexpressing the oxidant stress protein heme oxygenase 1 (9). In another study, they found that CSE caused an increase in the number of autophagosomes in Beas2b human bronchial epithelial cells (9). The CSE-induced autophagy defect served a proapoptotic function in cigarette smoke-exposed cells. Both of the studies from Choi and colleagues (8, 9) demonstrate concurrent upregulation of both autophagy and apoptosis. Their findings might explain the loss of peripheral lung tissue and apoptosis that is characteristic of emphysema. Our findings with alveolar macrophages differ from those of Choi et al. in that their work shows increased autophagy function, whereas our study found decreased autophagy function in alveolar macrophages. It is likely that our observations of decreased autophagy function in macrophages relate to the increased phagocytic capacity of alveolar macrophages, which makes them differentially susceptible to cigarette smoke exposure. One of the main functions of alveolar macrophages is phagocytosis of inhaled material, including particulates in cigarette smoke, making their exposure to cigarette smoke quite different from exposure of airway epithelium. In fact, we found that ingestion of carbon-black nanoparticles by alveolar macrophages induces a similar defect as cigarette smoke. It is likely that the different effects on the autophagy process lie in the very different functions of lung epithelium and alveolar macrophages. It is interesting to speculate that the increase in autophagy seen by Choi and colleagues (8) is the same as the increase in autophagy associated with programmed cell death recently reported as essential for presentation of phosphatidylserine on the cell surface (47). It is possible that autophagy in dying epithelial cells contributes to externalization of phosphatidylserine, whereas a lack of autophagy in alveolar macrophages contributes to a lack of clearance of dead cells from the alveolar surface. Both of these effects on the process of autophagy could contribute to smoking-related diseases. This study demonstrates a significant accumulation of autophagosomes in smokers’ alveolar macrophages. This also was demonstrated in in vitro models using macrophages from nonsmokers acutely exposed to CSE. Our data suggest that these structures accumulate because they are not being turned over via fusion with lysosomes. In this regard, smokers’ macrophages contain a large amount of cigarette smoke particulates that appear to be within the autophagosomes. Montgomery et al. (48) showed that loading macrophages with poorly digestible material resulted in a defect in autophagy/lysosomal function. Our data support a defect in the delivery of autophagosomes to the lysosome in smokers’ alveolar macrophages. Long-term in vivo cigarette smoke exposure led to a buildup of hmw ubiquitin and sumo complexes in smokers’ alveolar macrophages. We believe that this buildup is linked to a block in the process of autophagy. Recent studies have shown that autophagy as well as the proteasome clear ubiquitin-bound substrates (49). Three proteins that bind both ubiquitin and LC3, p62/SQSTM1, NBR1, and NDP52 have been identified (50). They are thought to act as chaperones, delivering ubiquitinated proteins to the autophagosome (29, 31). In the current study, cigarette smoke exposure led to an increase in sequestration of p62 in hmw complexes. Mitophagy refers to the clearance of damaged mitochondria by autophagy. The importance of autophagy in clearing damaged mitochondria has been shown convincingly in recent studies (51–53). The effect of smoking-induced mitochondrial dysfunction in alveolar macrophages could be due to a global effect on autophagy or could be due to an effect on one of the adaptor proteins shown recently to target damaged mitochondria to the autophagosome. In mammalian cells, the cytosolic protein Parkin is recruited selectively to damaged mitochondria (54). Recruitment of Parkin and the PTEN-induced putative kinase-1 to damaged mitochondria leads to mitophagy and clearance of mitochondria. Another adaptor protein involved in mitophagy is the protein Nix. Nix forms a complex with LC3 and GABARAP-L1 that mediates mitochondrial clearance (55). It will be interesting to see if smoking alters expression or function of either Parkin or Nix. It is clear from our data that in smokers’ alveolar macrophages there is a loss of mitochondrial ATP-generating capacity (consistent with mitochondrial dysfunction) and an increase in damaged mitochondria. Autophagy has a number of described immune functions, including homeostasis of B, T, and other immune cells, activation or dampening of proinflammatory processes, and clearance of pathogens that reach the cytosol (44). Xenophagy is the term coined to cover the subset of autophagy involved in pathogen clearance (42, 56). Bacteria that reach the cytosol are targeted to nascent LC3-containing phagophores by adaptor proteins that have an LC3-interaction domain. For example, Listeria lacking ActA that escape to the cytosol become covered with ubiquitin. It is then recognized by p62 and targeted to the autophagosome (57). Salmonella that escape from damaged vacuoles has been shown to colocalize with polyubiquitin complexes, which are delivered to the autophagosome via p62 and LC3 (58). Much of the early work on xenophagy has been performed by Levine and co-workers (45), including an elegant study in nematodes showing an in vivo role for xenophagy in Salmonella typhimurium clearance. In our study, E. coli particles that are phagocytosed by smokers’ alveolar macrophages are not delivered to the lysosome. These data are consistent with a defect in xenophagy with chronic cigarette smoke exposure. This study makes two contributions to our knowledge of the effects of cigarette smoke in the lung. The first is the demonstration of a basic biological mechanism whereby cigarette smoke alters the process of autophagy. The second contribution addresses the clinical issue of recurrent infections in people who smoke. Obviously, the best treatment is to stop smoking. However, COPD is the fourth leading cause of death in the United States, and cigarette smoke exposure accounts for >80–90% of U.S. COPD cases (59). With the understanding that there is a defect in pathogen clearance due to altered autophagy, it is possible that pharmaceutical agents that target autophagy could decrease smoking-related infection rates and subsequently health care costs. We thank Chris C. Weihl for sharing the polyQ80-luciferase vector and Johansen Terje for sharing the mCherry-GFP-p62 vector. This work was supported by National Institutes of Health Grants R01 HL079901, R01 HL077431, and R01 HL096625 and Grant UL1RR024979 from the National Center for Research Resources, a part of the National Institutes of Health. The contents of this paper are solely the responsibility of the authors.
. 1974. Pathologic changes in the peripheral airways of young cigarette smokers. N. Engl. J. Med. 291: 755–758. 1968. Cigarette smoke: protection of alveolar macrophages by glutathione and cysteine. Science 162: 810–811.
. 1963. Clearance of bacteria by the lower respiratory tract. Science 142: 1572–1573.
. 2000. Autophagy as a regulated pathway of cellular degradation. Science 290: 1717–1721.
. 2008. Autophagy in the pathogenesis of disease. Cell 132: 27–42.
. 2008. Autophagy fights disease through cellular self-digestion. Nature 451: 1069–1075.
. 2010. Nod1 and Nod2 direct autophagy by recruiting ATG16L1 to the plasma membrane at the site of bacterial entry. Nat. Immunol. 11: 55–62.
. 2008. Egr-1 regulates autophagy in cigarette smoke-induced chronic obstructive pulmonary disease. PLoS One 3: e3316.
. 2008. Autophagic proteins regulate cigarette smoke-induced apoptosis: protective role of heme oxygenase-1. Autophagy 4: 887–895.
. 2000. Cigarette smoking and invasive pneumococcal disease. N. Engl. J. Med. 342: 681–689.
. 2004. Impact of cigarette smoke on clearance and inflammation after Pseudomonas aeruginosa infection. Am. J. Respir. Crit. Care Med. 170: 1164–1171.
. 2009. Quantitation of selective autophagic protein aggregate degradation in vitro and in vivo using luciferase reporters. Autophagy 5: 511–519.
. 1999. Human alveolar macrophages are markedly deficient in REF-1 and AP-1 DNA binding activity. J. Biol. Chem. 274: 18075–18080.
. 2006. Cigarette smoke induces cellular senescence. Am. J. Respir. Cell Mol. Biol. 35: 681–688.
. 2009. Cigarette smoke induces cellular senescence via Werner’s syndrome protein down-regulation. Am. J. Respir. Crit. Care Med. 179: 279–287.
. 1978. Possible mechanisms of emphysema in cigarette smokers. Release of elastase from human polymorphonuclear leukocytes by cigarette smoke condensate in vitro. Am. Rev. Respir. Dis. 117: 317–325.
. 2004. Cigarette smoke extract increases S-adenosylmethionine and cystathionine in human lung epithelial-like (A549) cells. Chem. Biol. Interact. 147: 87–97.
. 2003. Cigarette smoke extract induces oxidative stress and apoptosis in human lung fibroblasts. Am. J. Physiol. Lung Cell. Mol. Physiol. 284: L955–L963.
. 2008. Respiratory epithelial cells convert inactive vitamin D to its active form: potential effects on host defense. J. Immunol. 181: 7090–7099.
. 2008. Constitutive ERK MAPK activity regulates macrophage ATP production and mitochondrial integrity. J. Immunol. 180: 7485–7496.
. 2008. Guidelines for the use and interpretation of assays for monitoring autophagy in higher eukaryotes. Autophagy 4: 151–175.
. 2010. Methods in mammalian autophagy research. Cell 140: 313–326.
. 2010. Autophagy reduces acute ethanol-induced hepatotoxicity and steatosis in mice. Gastroenterology DOI:10.1053/j.gastro.2010.07.041.
. 1996. Guanine nucleotide exchange on heterotrimeric Gi3 protein controls autophagic sequestration in HT-29 cells. J. Biol. Chem. 271: 28593–28600.
. 2010. The selective autophagy substrate p62 activates the stress responsive transcription factor Nrf2 through inactivation of Keap1. Nat. Cell Biol. 12: 213–223.
. 2009. To aggregate or not to aggregate? A new role for p62. EMBO Rep. 10: 804.
. 2009. p62 at the crossroads of autophagy, apoptosis, and cancer. Cell 137: 1001–1004.
. 2010. 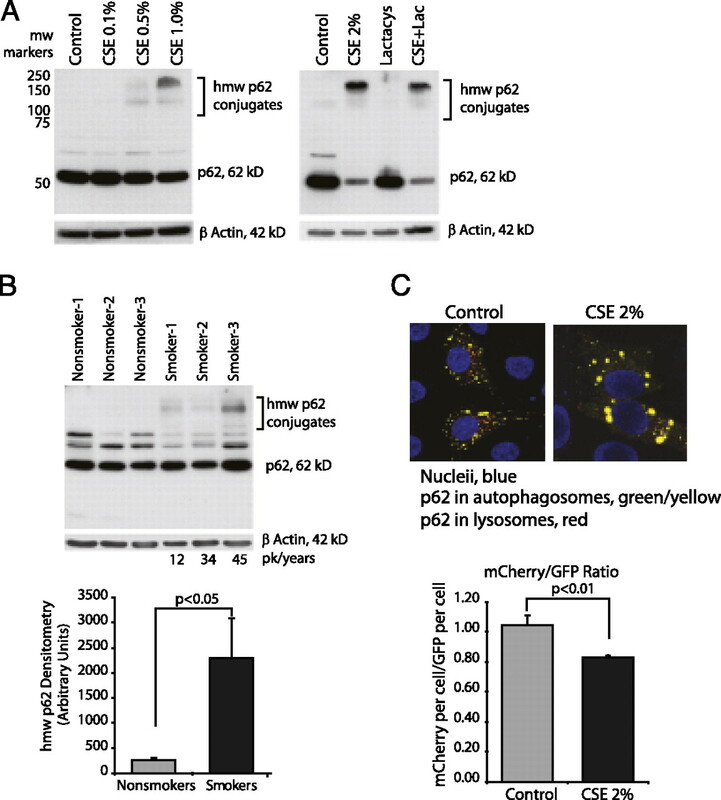 Delivery of cytosolic components by autophagic adaptor protein p62 endows autophagosomes with unique antimicrobial properties. Immunity 32: 329–341.
. 2009. A role for ubiquitin in selective autophagy. Mol. Cell 34: 259–269.
. 2006. Cell signaling and function organized by PB1 domain interactions. Mol. Cell 23: 631–640.
. 2007. p62/SQSTM1 binds directly to Atg8/LC3 to facilitate degradation of ubiquitinated protein aggregates by autophagy. J. Biol. Chem. 282: 24131–24145.
. 2008. Ubiquitin signals autophagic degradation of cytosolic proteins and peroxisomes. Proc. Natl. Acad. Sci. USA 105: 20567–20574.
. 2007. Parkin-mediated K63-linked polyubiquitination targets misfolded DJ-1 to aggresomes via binding to HDAC6. J. Cell Biol. 178: 1025–1038.
. 2008. 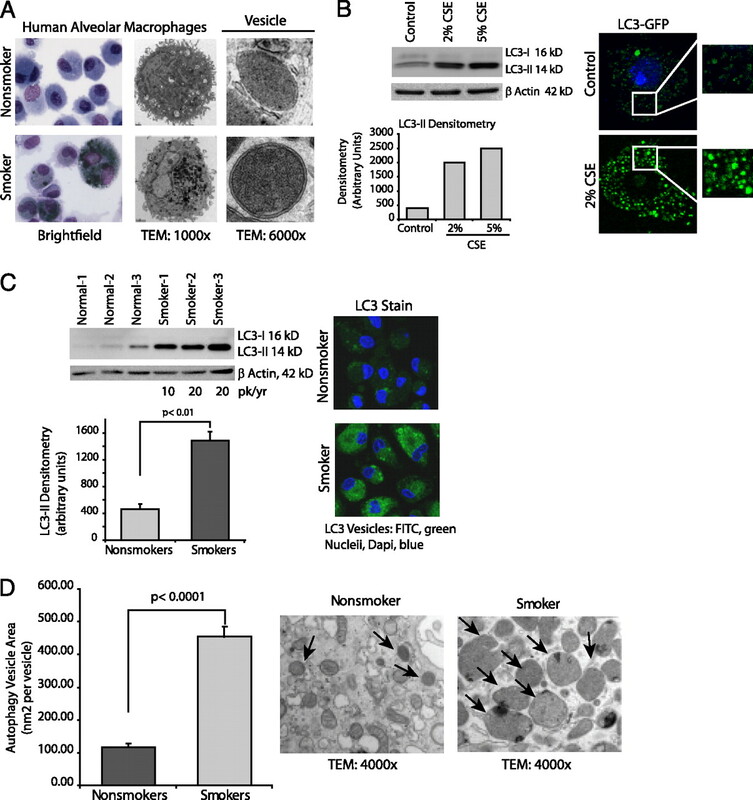 Lysine 63-linked ubiquitination promotes the formation and autophagic clearance of protein inclusions associated with neurodegenerative diseases. Hum. Mol. Genet. 17: 431–439.
. 2008. Essential role of sequestosome 1/p62 in regulating accumulation of Lys63-ubiquitinated proteins. J. Biol. Chem. 283: 6783–6789.
. 2004. Specific and covalent targeting of conjugating and deconjugating enzymes of ubiquitin-like proteins. Mol. Cell. Biol. 24: 84–95. 2000. Biochemistry. All in the ubiquitin family. Science 289: 563–564. 2000. Evolution and function of ubiquitin-like protein-conjugation systems. Nat. Cell Biol. 2: E153–E157. 2008. The fast-growing business of SUMO chains. Mol. Cell 32: 301–305.
. 2009. Autophagy suppresses tumorigenesis through elimination of p62. Cell 137: 1062–1075.
. 2008. Mitophagy in yeast occurs through a selective mechanism. J. Biol. Chem. 283: 32386–32393.
. 2009. Autophagy, immunity, and microbial adaptations. Cell Host Microbe 5: 527–549.
. 2004. Autophagy is a defense mechanism inhibiting BCG and Mycobacterium tuberculosis survival in infected macrophages. Cell 119: 753–766. 2005. Eating oneself and uninvited guests: autophagy-related pathways in cellular defense. Cell 120: 159–162.
. 2009. Autophagy genes protect against Salmonella typhimurium infection and mediate insulin signaling-regulated pathogen resistance. Proc. Natl. Acad. Sci. USA 106: 14564–14569.
. 2009. Autophagy genes in immunity. Nat. Immunol. 10: 461–470.
. 2007. Autophagy gene-dependent clearance of apoptotic cells during embryonic development. Cell 128: 931–946.
. 1991. Accumulation of indigestible substances reduces fusion competence of macrophage lysosomes. J. Immunol. 147: 3087–3095.
. 2009. Autophagy inhibition compromises degradation of ubiquitin-proteasome pathway substrates. Mol. Cell 33: 517–527.
. 2009. NDP52: the missing link between ubiquitinated bacteria and autophagy. Nat. Immunol. 10: 1137–1139.
. 2001. The mitochondrial permeability transition initiates autophagy in rat hepatocytes. FASEB J. 15: 2286–2287.
. 2007. Selective degradation of mitochondria by mitophagy. Arch. Biochem. Biophys. 462: 245–253.
. 2008. Parkin is recruited selectively to impaired mitochondria and promotes their autophagy. J. Cell Biol. 183: 795–803.
. 2010. PINK1-dependent recruitment of Parkin to mitochondria in mitophagy. Proc. Natl. Acad. Sci. USA 107: 378–383.
. 2010. Nix is a selective autophagy receptor for mitochondrial clearance. EMBO Rep. 11: 45–51. 2010. Autophagy in infection. Curr. Opin. Cell Biol. 22: 252–262.
. 2009. Listeria monocytogenes ActA-mediated escape from autophagic recognition. Nat. Cell Biol. 11: 1233–1240.
. 2009. The adaptor protein p62/SQSTM1 targets invading bacteria to the autophagy pathway. J. Immunol. 183: 5909–5916.
. 2009. Pulmonary epithelial neuropilin-1 deletion enhances development of cigarette smoke-induced emphysema. Am. J. Respir. Crit. Care Med. 180: 396–406.